Yukihiro/Sato/Yamamoto Number One In Nagoya! Calling themselves "Japanese Peach Garden Oath", Ken Yukuhiro, Rei Sato, and Kentaro Yamamoto clinched the top spot and earned their second Grand Prix title alongside one another! THE HASHTAG FOR GRAND PRIX NAGOYA IS #GPNAGOYA. JOIN THE CONVERSATION. Grand Prix Nagoya 2018 is in the books! After fourteen rounds of Team Sealed and two exciting Team Drafts, only one team was left standing after annihilating 663 others. Not only did Ken Yukuhiro, Rei Sato, and Kentaro Yamamoto clinch the top spot, they all added a second Grand Prix title to their already impressive résumés! 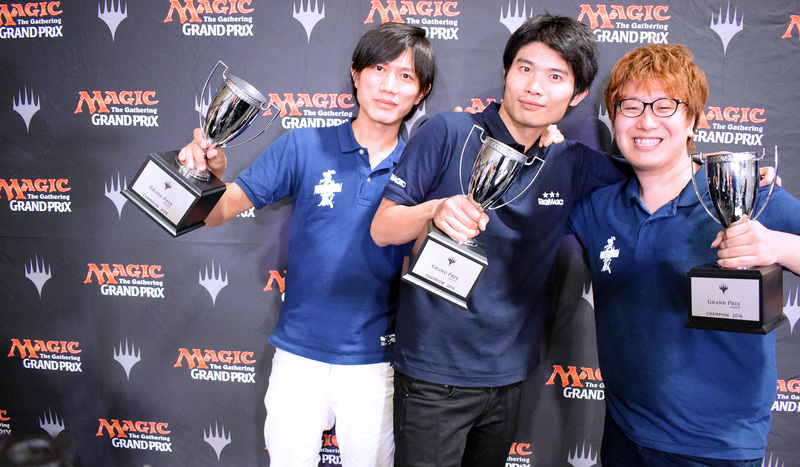 11th-ranked Yukuhiro previously won Grand Prix Singapore 2013, while Sato and Yamamoto took down Grand Prix Hong Kong 2017 and Grand Prix Chiba 2016 respectively! Enroute to their victory, the "Japanese Peach Garden Oath" defeated Yuki Matsumoto, Shuhei Nakamura, and Yoshihiko Ikawa in the semifinals, as well as Yuuya Hosokawa, Makihito Mihara, and Naoki Shimizu in the finals. Rounding out the Top 4 were first-timers Hirotoshi Yoshiura, Shouya Katou, and Kawanishi Kawanishi, who were ecstatic to have qualified for their very first Pro Tour! These twelve players now have a combined of 80 Grand Prix Top 8s and 17 Grand Prix victories, making it one of the most stacked Top 4s in recent memory. An honorable mention also goes to Shuhei Nakamura, for achieving his 30th lifetime Grand Prix Top 8! However, the heroes of the hour are still Ken Yukuhiro, Rei Sato, and Kentaro Yamamoto! Once again, congratulations to you three for winning Grand Prix Nagoya 2018! After eight rounds of intense competition, the field of 664 teams was reduced down to just 83. Among those were two 8-0 teams, namely the trios of Salvador-Kanegawa-Tomizawa and Umeno-Shiki-Katou! At 7-0-1 were two relatively unknown trios of Okada-Sugiyama-Takahashi and Igarasi-Kuribara-Iwagami, but close behind them were Yukuhiro-Sato-Yamamoto, Inoue-Kamo-Takao, Matsumoto-Nakamura-Ikawa, and twelve other teams at 7-1. Hosokawa-Mihara-Shimizu and Tamada-Kakumae-Harane were among the most notable teams to make the 6-2 cut. Be back tomorrow as we continue diving into the heart of Ravnica. Teams will return for a second Team Sealed tomorrow and six more rounds will determine the Top 4!